I can honestly say that I had never made a bath bomb before now. However, I found a silicon pumpkin mould lurking at the back of the cupboard and decided today was the day. Recently I’ve been trying to strip back to the more natural way of living. First, we went vegan and now I’m making my own homemade beauty treatments! Who would have thought it? For those of you who know me, you’ll know that I’m highly strung and extremely anxious most of the time (and that’s on a good day) but hand on heart I came out of my pumpkin bath feeling genuinely relaxed and calm. 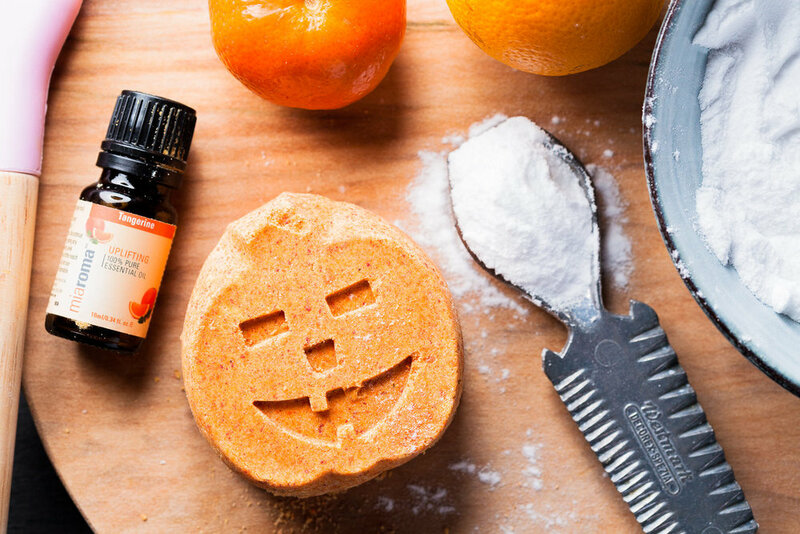 So, this may be a Halloween themed luxury but this recipe is perfect for all of the family to help calm and uplift. I should add at this point that I am not a scientist or a beautician and everyone using this recipe should always do a skin test with the ingredients first. That being said I have used the most natural and gentle of ingredients because Pops is an eczema sufferer and it was extremely gentle on her skin. Most people use citric acid to make bath bombs as it creates a fantastic fizz but as I was using this recipe on the kids I wanted to use much gentler ingredients. So in place of the citric acid, I used cream of tartar. It didn’t fizz like crazy but it definitely fizzed and the kid’s faces were pure delight as their bath turned orange and the bathroom filled with the scent of tangerines. Always show caution with essential oils (they are more powerful than you think) but I found this page about what essential oils are safe for children and decided upon using tangerine as it’s used to promote feelings of happiness and energy and can even help boost your immune system. So without further ado let’s get to making these super simple bath bombs. Leave to dry overnight and then turn out your pumpkin pals ready for use. It really is a simple craft and I am now scouting Amazon for bulk buy ingredients and more silicone moulds. I’m hooked! I look forward to sharing more natural beauty secrets with you in the future. Please feel free to share with me too. I love hearing from you all! Again please use caution particularly when using on children and always patch test first to check for any allergies. Also never use this bath bomb on broken skin and never ingest. For external use only.